IS THIS A TOM THUMB WEDDING PHOTOGRAPH OR IS THIS A PORTRAIT OF A REINCARNATED GEORGE AND MARTHA WASHINGTON? This cabinet card poses an interesting question. My first impression upon looking at the photograph was that it was an example of a “Tom Thumb Wedding Portrait”. What is a “Tom Thumb Wedding” ? The answer offers an interesting social commentary. A “Tom Thumb Wedding” is a wedding pageant in which the major wedding roles are played by children; usually under ten years old. Not only are the bride and groom portrayed, but so are the best man, maid of honor, groomsmen, bridesmaids and the clergyman. Some of these weddings involved more then twenty children playing costumed parts. Often times, the weddings were fund raising events for charitable causes. These faux weddings became popular after the wedding of General Tom Thumb (Charles Stratton) to Lavinia Warren in 1863. Tom Thumb’s wedding was very publicized by the media in America and received the attention across the county. Not having any royal families, Americans had to find celebrities to obsess over. Tom Thumb had a great promoter keeping him in the public’s eye. P. T. Barnum, the circus entrepreneur managed Tom Thumbs career. 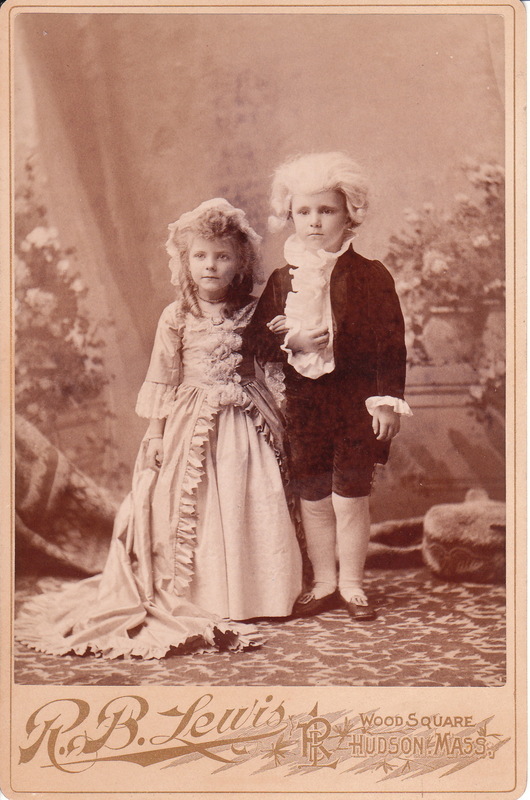 The previous owner of this cabinet card contends that this image is actually a portrait of a boy and a girl portraying George and Martha Washington. I have to give the last owner’s theory credibility because over the years I have been collecting these photographs, I have seen a number of portraits of children portraying George and Martha. Sometimes the images present them together and sometimes separately. In conclusion, there is no conclusion. What do you think, “Tom Thumb Wedding” or “Portrayal of George and Martha Washington”. The photographer of this image is R. B. Lewis of Hudson, Massachusetts. He is cited in the Photographic Journal of America (1893) for an excellent photograph of a football team. Lewis is also listed in the Hudson city directory as a photographer between at least 1872 and 1909. Click on the category, “Tom Thumb Wedding” to view other examples of “Tom Thumb Wedding” photographs. To view other photographs by R. B. Lewis, click on the category “Photographer: Lewis”.